An exhibition of African-American self-taught artists and graffiti muralists, organized by the beleaguered American Folk Art Museum in New York, has been canceled by exhibition sponsor Benetton. The show was scheduled for June 1-30, to coincide with the opening of the Venice Biennale.”Vision and Vernacular: Eight African American Artists in Venice” was to have been held at the Fondaco dei Tedeschi, a property owned by the Benetton Group near the Rialto Bridge. Curated by Carlo McCormick and Martha V. Henry, it would have featured works by Outsider artists Lonnie Holley, Mr. Imagination (Gregory Warmack), Charles Lucas and Kevin Sampson, and site-specific murals by street artists Blade (Steven Ogburn), Daze (Chris Ellis), Quik (Lin Felton) and Sharp (Aaron Goodstone). According to a Benetton spokesperson, the 13th-century Fondaco dei Tedeschi has been unoccupied for many years and “due to its condition, we were unable to obtain the necessary permits, certifications, and finish the modifications necessary to insure the safety of the crowds expected for this exhibition. The project has been postponed to the reopening of the Fondaco after its renovation by Rem Koolhaus.” Plans call for the structure to become a retail and exhibition space. Benetton told A.i.A. that the cancellation is “in no way related to the American Folk Art Museum” and that it hopes to mount an identical exhibition in the future. The fashion house was sponsoring the exhibition, offering the space to the museum for free, and providing exhibition support and an opening-night party. Reached by phone, McCormick told A.i.A. that Benetton and the Folk Art Museum “bickered every step of the way.” Though the reasons for the cancellation were unclear, McCormick suspected it had to do with who would pay for what. He was notified of the cancellation yesterday. The museum has been in financial straits, and has not made payments on the $30 million it still owes for its $32-million building, designed by Tod Williams and Billie Tsien, which opened in 2001 next to MoMA on 53rd Street. As reported in the New York Times on Feb. 22, the museum entered into a forbearance agreement with ACA Financial Guaranty last summer. That agreement expires on June 30, with payment due in July. The museum’s financial statements for the fiscal year ending June 30, 2010, reflect a deficit of $3.6 million. Conelli told the Times in February that the institution had a balanced budget for this fiscal year. The Venice exhibition had a budget of upwards of $400,000, much of which was provided by individual donors and foundations, including the Ford Foundation. * An earlier version of this article reported in the first paragraph that the Folk Art Museum canceled this exhibition. The exhibition was canceled by the Benetton Group. 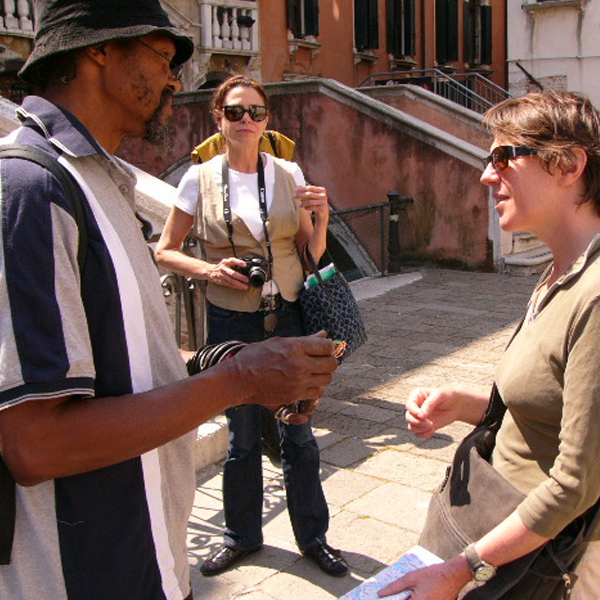 A noteworthy plan to take artworks by eight African-American artists to the 54th Venice Biennale, June 4-Nov. 27, 2011, has been suddenly canceled at the last minute by its corporate sponsor, Benetton. Originally undertaken in collaboration with the American Folk Art Museum, the exhibition was called off because the planned site, the unoccupied and historic Fondaco dei Tedeschi adjacent to the Rialto Bridge, could not be renovated in time, according to the clothing company. Cynics might be forgiven for suspecting a different reason: The celebration of graffiti in Los Angeles, via “Art of the Streets” at LA MOCA, prompted a conservative cultural backlash as well as a reported eruption of tagging in the museum neighborhood, and the idea of encouraging graffiti in Venice with a prestigious art show must have struck some city fathers as less than a great idea. Under the Benetton scheme for Venice, curators Martha Henry and Carlo McCormick selected four graffiti artists (Blade, DAZE, QUIK and Sharp) and four Outsider Artists (Lonnie Holley, Mr. Imagination, Tin Man [pictured] andKevin Sampson) to show at the biennale — plans that are now cancelled. “It seems the Folk Art Museum and Benetton spent all their time fighting with one another rather than getting together to make this happen,” said one insider. Will Benetton stiff the eight black artists on their promised payday? Stay tuned.